What could be better than a fall weekend in Paris with an old friend? Meeting a college buddy who lives abroad, we chose The City of Lights for a few days of catching up and trading stories all while shopping, eating and soaking in the sights. A visit to the renovated Picasso Museum and the Foundation Louis Vuitton were a big part of the draw. The Musee Rodin a Daytripper favorite. 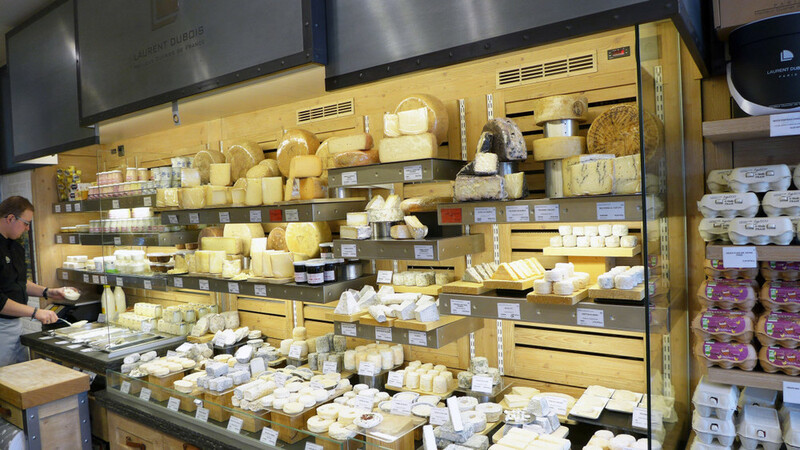 Cheese friends listen up…you can take some back home with you! At the amazing Laurent Dubois in the Left Bank they will vacuum pack your purchases for travel. Once sealed, it’s good for 10 days to share with your “good” friends. Stay: You can never go wrong with one of the grand, luxury hotels on the Right Bank such as the Le Bristol, Plaza Athenee, Le Royal Monceau or the fabulous new La Reserve. The fashionable still flock to Hotel Costes and the newly renovated Ritz or Hotel de Crillon. But, for me, Paris' Left Bank has always been the place to stay. It’s Paris at its best--a neighborhood with character and charm, centrally located to all the best sights and shops. We checked into the Hotel Recamier, a quiet, sophisticated six-story townhouse perfectly located near the Luxembourg Gardens and a close walk to our daily breakfast at Café Flore. Other left bank favorites include L’Hotel, Montalembert or the newly renovated Hotel Lutetia. Morning Arrival: What better way to combat jet lag than some left bank shopping and strolling? Some of the best galleries, boutiques, gourmet and home furnishings shops can be found in St. Germain des Pres. First stop, Hermes. The store housed in a 1930’s art deco beauty, once the Lutetia swimming pool, is one of the most stunning spaces in Paris with an in store florist, bookshop and cafe. From here we wandered the streets between Cherche Midi, Rue de Grenelle and Rue de Bac. For a quick snack visit Poilaine, one of my favorite bakeries to taste the best baguette or butter cookies. Nearby is the site of Eric Kayser's first bakery and definitely worth a visit. Something always makes it into my suitcase from the amazing food hall, La Grand Epicerie, at Bon Marche. Essential Art: Constance Guisset enjoys a full exhibition at Les Arts Décoratifs that explores the creative universe of an artist who in only a few years has become one of the major figures of French design. One can easily spend an entire trip visiting the Louvre, Centre Georges Pompidou and L’Orangerie, but to me there is nothing better than setting aside a few hours to see the Impressionists greatest hits at the Musee d’Orsay. Chic Aperitif: Yves Camdeborde is quite the legend in Paris. His restaurant, Le Comptoir, meaning “at the counter” is perennially packed so to handle the overflow Yves opened a creperie/bar right next door. Don’t be deceived by the plastic curtains, behind lies L’Avant Comptoir – a hidden gem where the bartenders serve wines from small producers to compliment little tapas plates like grilled shisiedo peppers, hams, and other delicious bites. Make sure to order some bread and butter, this is “eating” butter as it was lovingly described to us by a food obsessed friend, and highly addictive! Dinner: It was fashion week during my stay and all the most smart, see and be seen places such as Le Stressa, L’Avenue, Voltaire, L’Ami Louis, and Le Societe were booked way in advance. Instead, we opted for an intimate venue with a cool vibe. It’s almost impossible to get reservations at the restaurant Frenchie, but you can cue up at 6:45 for the wine bar across the street (get there a minute later and you will not be able to get a table for the first seating.) Our meal was incredible! Another good choice is Le Chateaubriand or Clamato, owned by the same group behind the fabulous Septime. (Clamato also does not take reservations.) A friend recently recommended Le Recamier and advised not to miss the incredible soufflé desserts. Morning Fuel: Located in the 1st arrondissement, Claus is a great choice for breakfast before heading to the Marais. Marais Morning: Begin your day at the Picasso Museum; located in a 17th century home, recently reopened after an extensive five year renovation which doubled its size. This is a venue that matches the art, and a must do when visiting Paris. Afterwards, get out and roam the Marais. There are tons of great shops and galleries lining the charming streets. See a full itinerary for here.